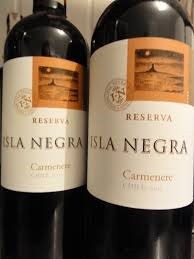 Vino Cono Sur-Isla Negra-Carménère-Reserva-Central Valley-Chile-2013-12.5% Alcohol-$4.75(Poland)-A nose of some dark fruit and spice, medium garnet in color. 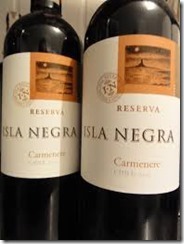 A medium bodied red, with some blueberry, currants and spices, a good value. NR CR-86 Good with meats, chicken, pasta. C.V.B.C. 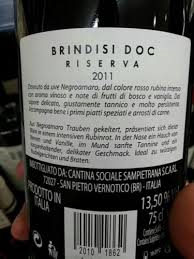 & C Spa-Brindisi-Tor Del Colle-Negroamaro-Montepulciano-Riservs-Fossalta-Italy-2011-13.0% Alcohol-$10.00-(Poland)A nose of some dark fruit, dark garnet in color. 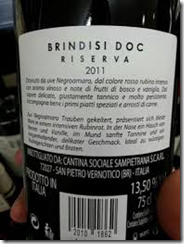 A medium to full bodied very dry red blend, with plum, cherry, earth, must drink with food. NR CR-84 Good with meats, chicken, pasta.